(Recto) at bottom left corner, signed by the artist "A.V. Velde fc." in red chalk. Adriaen van de Velde habitually ventured out in the countryside to sketch cattle and landscapes for his paintings. Before ever beginning a painting, he made a preliminary compositional sketch, proceeded to chalk studies of the animals and figures, and then completed a finished drawing. 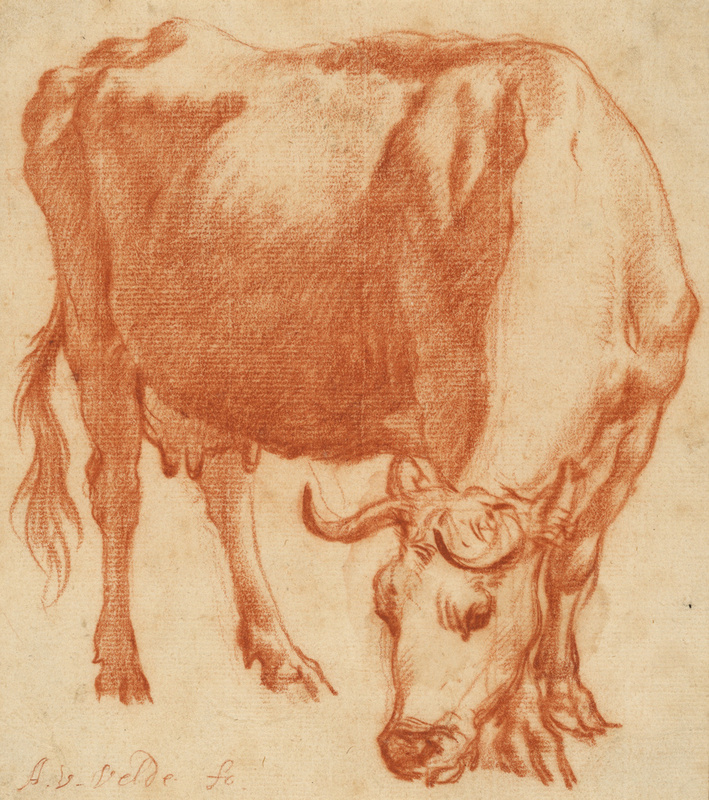 Departing from the usual norm of his animal drawings, van de Velde placed this cow not in a natural setting but in a close-up, seen from an angle that accentuates the animal's block-like form. Her neck, left shoulder, and head catch the sun directly, while light rakes across her back to reveal muscled forequarters, a protruding belly, and sunken hindquarters above the udder.